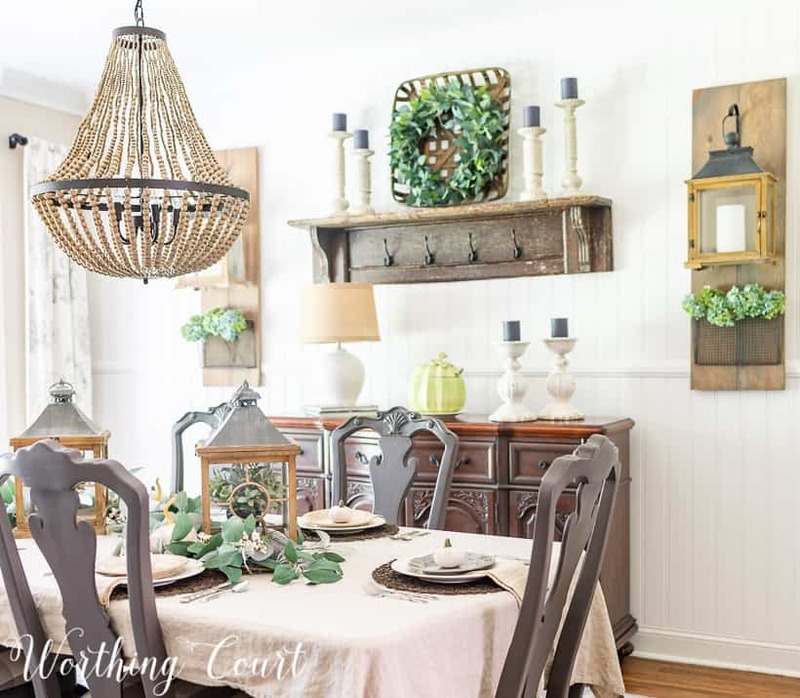 A CASUAL MEETS ELEGANT MEETS FARMHOUSE FALL DINING ROOM WITH IDEAS FOR NEUTRAL FALL DECOR USING SIMPLE ELEMENTS AND AN EASY TABLESCAPE. 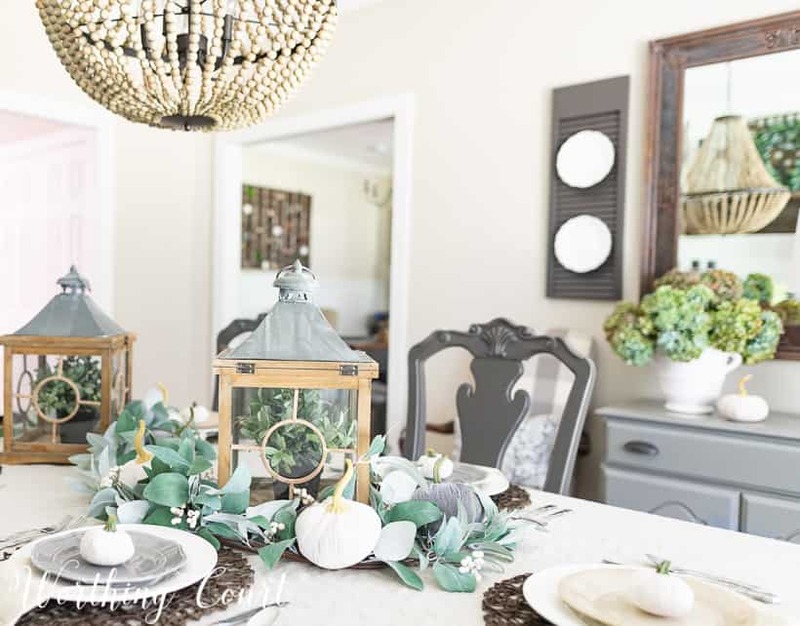 My dining room is one space in my home where I tend to get a little bit fancy when decorating for different seasons and holidays. If you’ve toured the rest of my home decorated for fall, then you know that I’m partial to keeping the flow of traditional fall colors going from room to room this time of year. 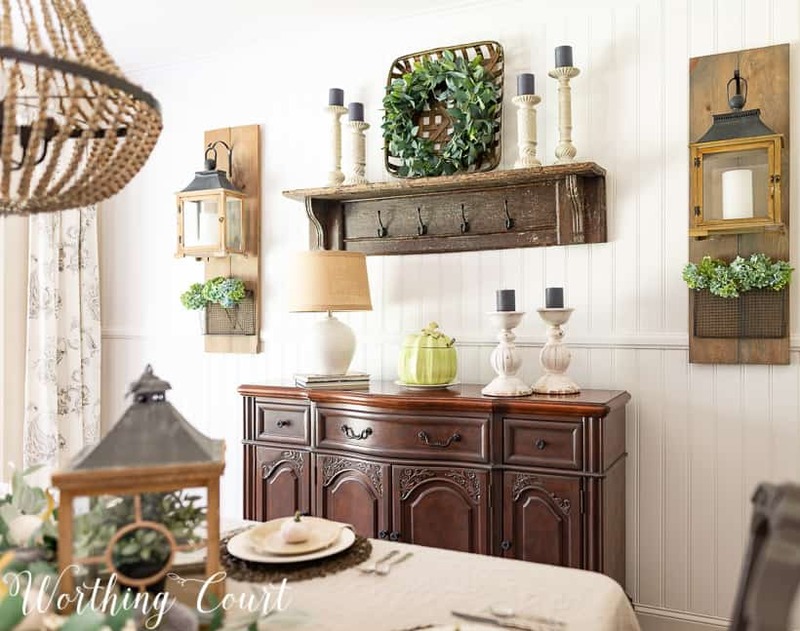 But – two things gave me the excuse that I needed to do something just a little bit different in my dining room and still have all of my spaces flow together. First up is the painting on my fall mantel that inspired all of my fall decor this year. In addition to rustic and traditional colors, the painting also included various shades of blue. Take a look at the painting I’m referring to HERE. Secondly, are the glorious blossoms that came from my first-time-ever-blooming hydrangea bushes. No way I was going to let them go to waste. Once they reached their blue peak, the incredible colors that they turned are pure perfection for fall! 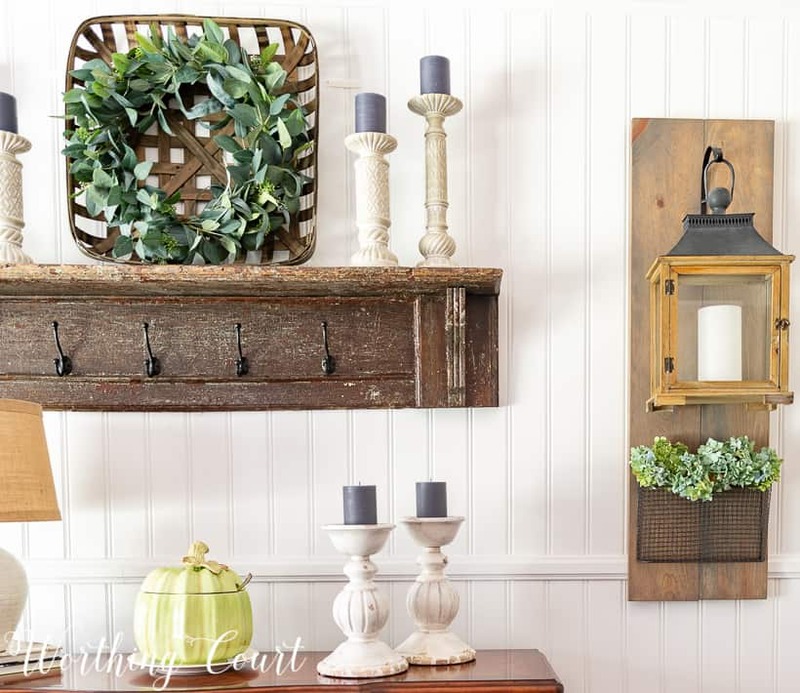 I even hinted that you’d be seeing them somewhere in my home by filling a burlap bag with them and also tucking them into the pumpkins in my fall foyer. YOU WON’T WANT TO MISS THE VIDEO TOUR DOWN BELOW! The foundation for my tablescape is a natural linen tablecloth, that I washed and did not iron after drying. I love the casual vibe that the unpressed linen gives to the whole table. I discovered that natural linen tableclothes can be pricey, but a I found a great quality one at a very affordable price HERE. You can get a much better feel for the casualness of the unpressed tablecloth in the video tour of the room at the bottom of this post. 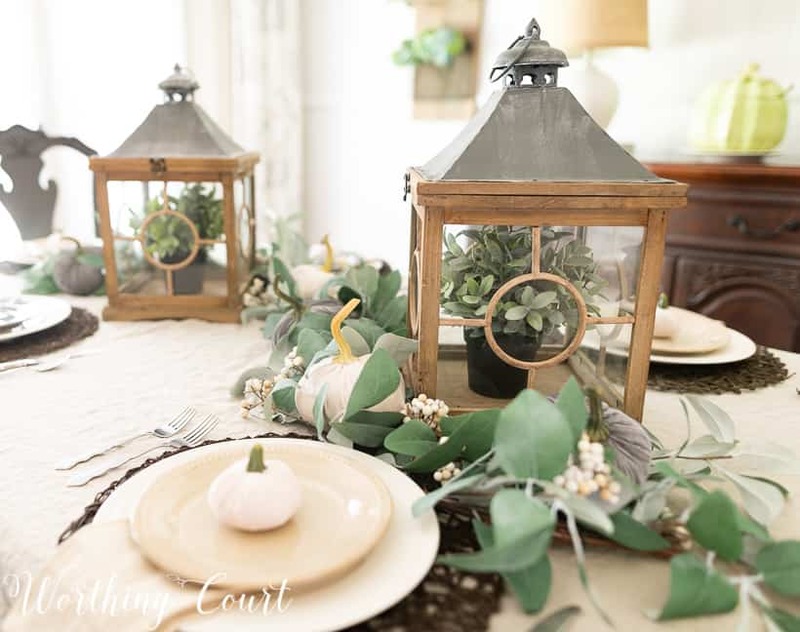 The next step was to create a centerpiece, which I did by snaking eucalyptus garlands around two square lanterns. To give them a lush look, I used two garlands and intertwined them together. The gorgeous greens and blues of the hydrangea blossoms are perfect for mixing with the sagey blue of eucalyptus. My garlands already had white berries attached to them, but a similar look could be achieved by simply tucking white berry sprigs into a plain leafy garland. 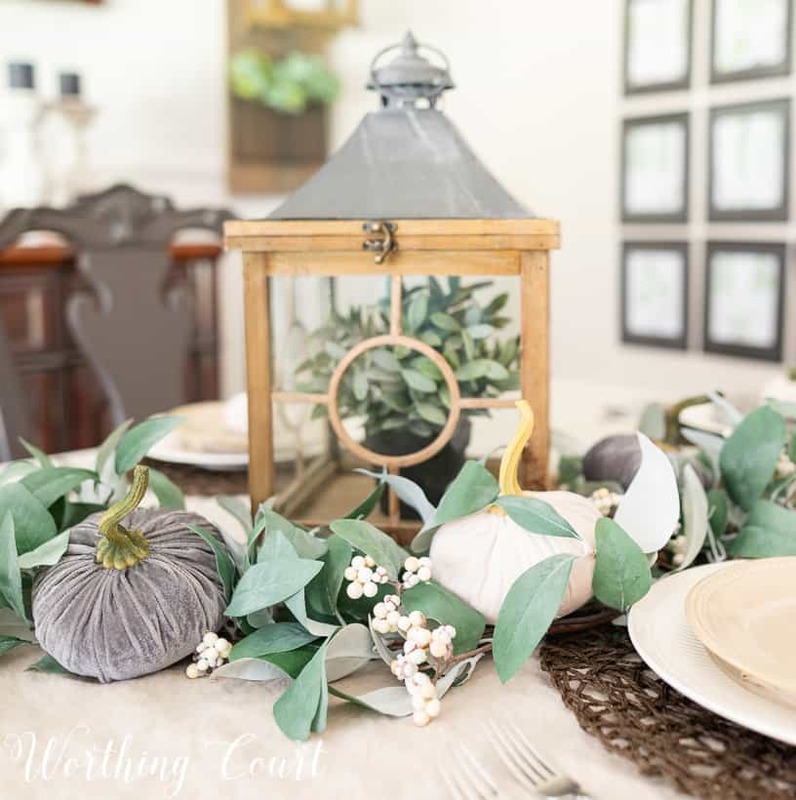 Gray and off-white velvet pumpkins were scattered all along the length of the garlands. 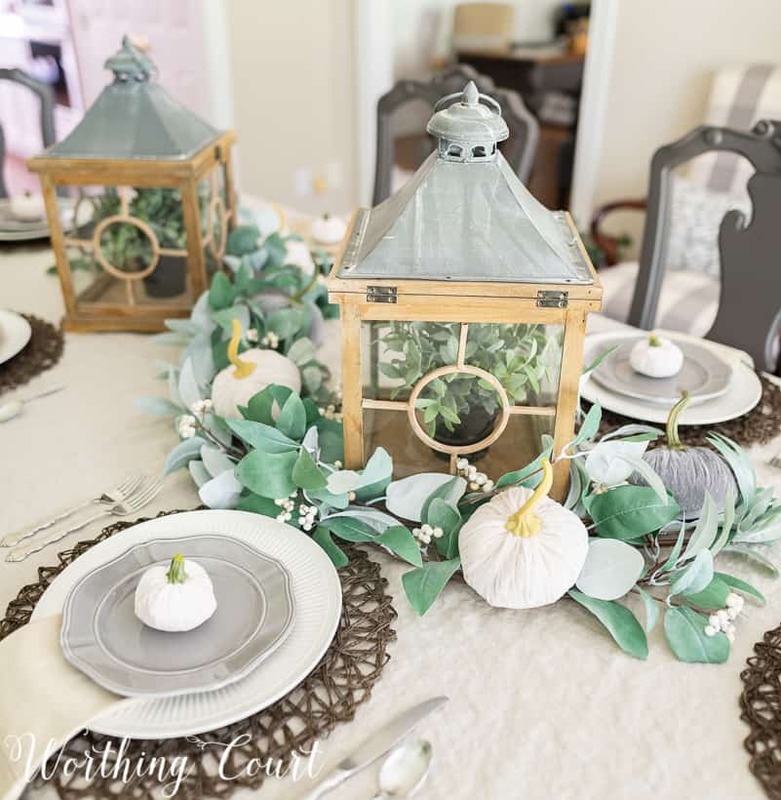 The rest of my table is very simply set with round woven placemats, my everyday dinnerware topped with a mixture of gray and beige salad plates adorned with tiny pumpkins. It’s a look that will last me all the way through fall and I can even use for Thanksgiving! 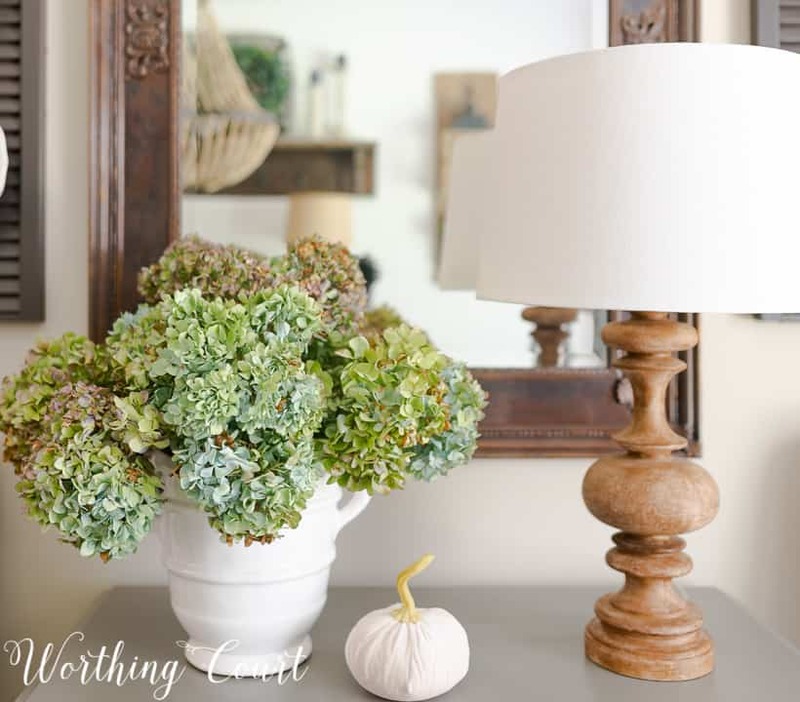 The fall decor on the sideboard and on my vintage shelf is very simple. I came across the green pumpkin soup tureen when digging through my fall decorations. I’ve had it for years and can’t believe that I never used it! 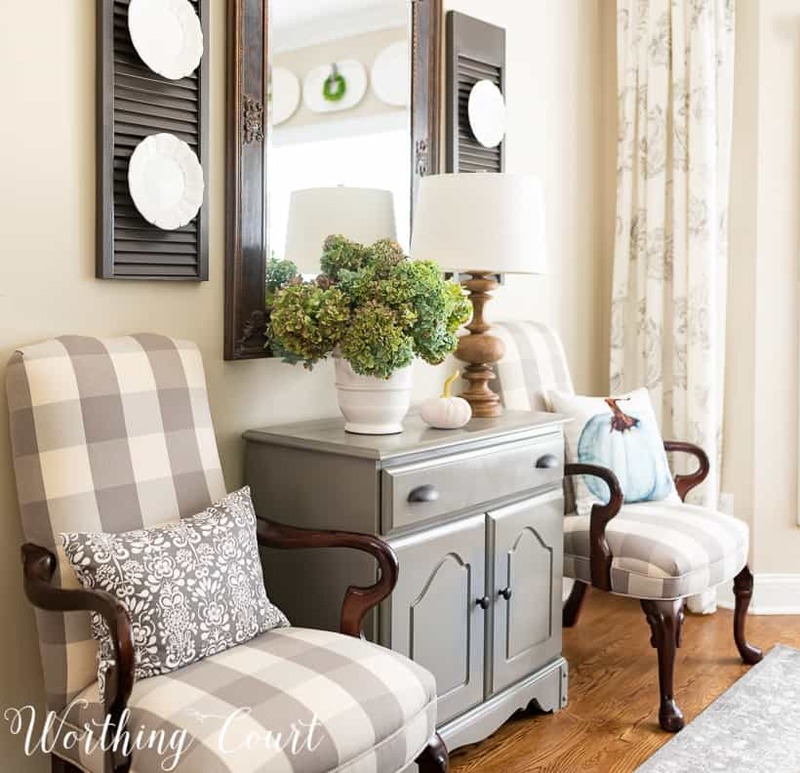 Even though it isn’t a sagey blue color, I still think it blends well with the rest of the greens and neutrals and I like the little pop that it adds on this side of the room. A eucalyptus wreath, hanging inside a square tobacco basket, reinforces the eucalyptus garland on the table. Simple candlesticks, topped with gray pillar candles, round out the rest of the area. Oh – but lets not overlook a few hydrangea blossoms that I added to the baskets attached to my diy hanging lanterns! Get the step by step tutorial for how to make these for your home HERE. And lastly, let’s take a look at what I keep bragging about – what I consider to be the star of the show! This arrangement of dried hydrangeas is glorious to me and deserves a spot all of its own, with nothing to take away from their beauty. I already have a spot picked out in another place in my home where I’ll display them year round, once fall is over. I just noticed my camera in the mirror reflection – oops! 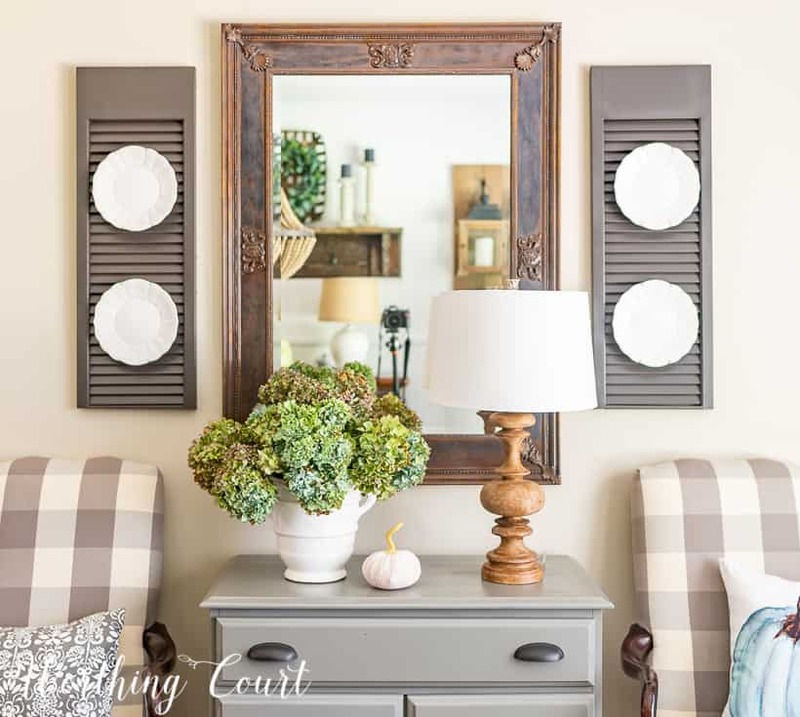 TAKE A CLOSER LOOK IN THIS VIDEO TOUR! I love the dining room. It’s casual and full of light. Thanks for the tips. I love this look. 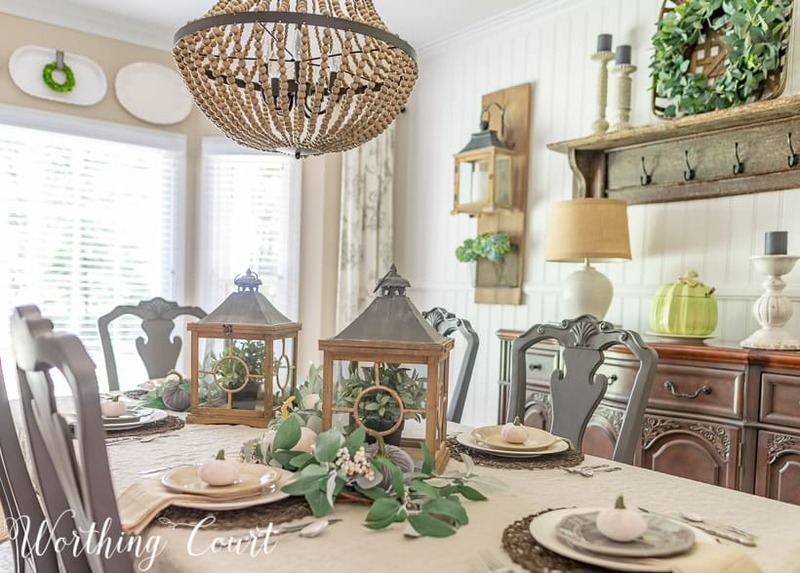 Going to be listing my house to sell this week, gave me some good table scape ideas. I have similar dining room chairs. Did you paint these gray? Lovely! 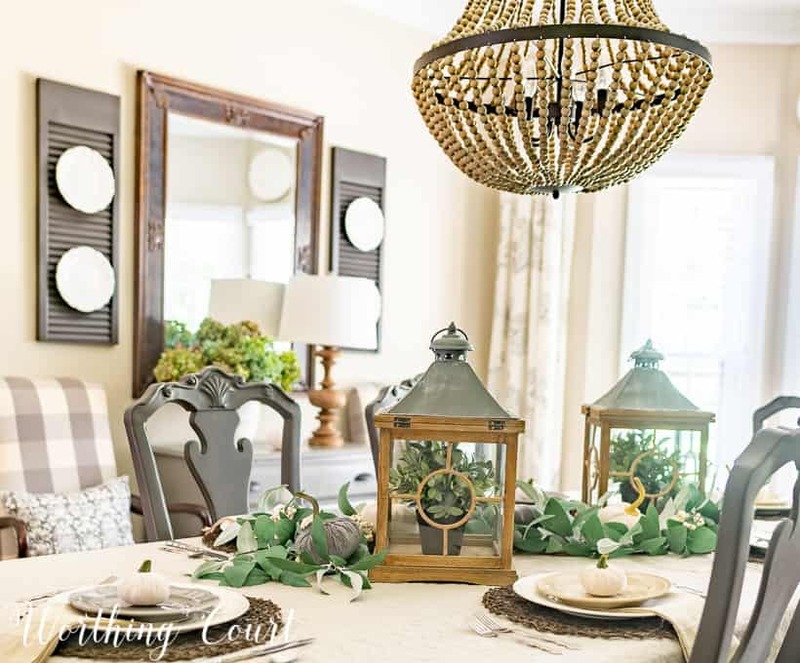 I particularly love those lanterns on the table, we don’t get many of those over here in Australia, so I will just have to enjoy yours from afar!